For Paul Schnarr, he calls them his bonus years. In the past 10 years, the Conestogo man watched as his daughters grow from teenagers into young women. He has walked one of them down the aisle and he has become a grandfather. The only thing he has not done is play hockey. It is the first time in his life he has spent that long off the ice. But given the alternative, he would not trade the past decade for anything. He would have missed out on so many things. Back in October 2, 2007, Schnarr was playing in the first game of the season for his recreational hockey team. It was late in the game when he experienced a heart attack and collapsed. His two teammates rushed over and executed CPR. Another rushed over to the automated external defibrillator (AED) of the arena. 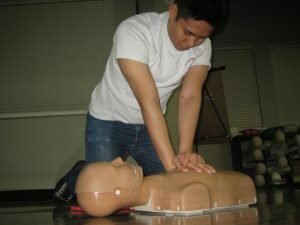 At the time, AEDs were not yet widely available. RIM Park was one of the few areas in Waterloo Region to have one available. It was only installed a few weeks earlier and Schnarr was the first it was used for. According to Schnarr, he was lucky that it happened there. They attached the device and delivered a shock that restored an effective rhythm. While still in an unconscious state, Schnarr was taken to a healthcare facility and spent several days in a coma, but eventually emerged alive. Since that day, Schnarr is an active advocate for increasing the availability and accessibility of AEDs in public areas.